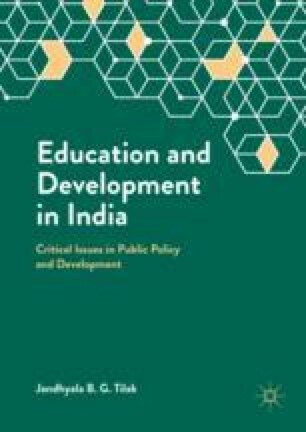 The chapter presents a critical review of educational developments in India in the overall framework of educational policies, plans and programmes and discusses rather somewhat inexplicable divergences between policies, plans and their translation into action. As an illustration, a few major financial policies in education are discussed. Concentration on financial aspects does not mean that problems of Indian education lie squarely in finances and can be satisfactorily resolved, if financial solvency is attained. But “educational finance is probably the most controversial issue in the economics of education.” After presenting a critical review of the achievements and failures of the education system in India, it analyses a few financial dimensions relating to Indian education. In the context of growing financial squeezes, one may hope that private sector may play an important role in easing the financial problems in education particularly in a mixed economy like India. Besides analysing the nature and contribution of private sector to educational development in the country, it outlines a pragmatic policy in financing education that may enhance the contribution of private sector to public schooling on the one hand, and on the other hand may make the system less regressive. Published as Working paper (Special Studies) No. 24, Comparative Education Center, State University of New York at Buffalo (in collaboration with the University of Virginia), 1990. © Center for Comparative and Global Education, State University of New York at Buffalo. Paper presented in the Seventh World Congress of Comparative Education Societies in the Panel on Assessing the Impacts of Educational Policies of Third World Nations at the University of Montreal, Montreal (July 1998), and also in the 1989 Research Symposium on East Asian Educational Reforms: East Asian Education in Transition (University of Virginia, Charlottesville, VA, (November 1989). Grateful acknowledgments are due to George Psacharopoulos, Theodore W. Schultz, Edward Shills, Philip G. Altbach, Peter Hackett, Uday Desai, Kazum Bacchus and N.V. Varghese for their intellectual help, encouragement, and comments on earlier drafts of the paper. The views expressed here are those of the author alone. A Hand Book of Education and Allied Statistics. (Occasional) New Delhi: Ministry of Human Resource Development, Government of India. Analysis of Budgeted Expenditure on Education. (Annual) New Delhi: Ministry of Human Resource Development, Department of Education, Planning, Monitoring and Statistics Division, Government of India. Education in India. (Annual) New Delhi: Ministry of Human Resource Development, Government of India. National Accounts Statistics. (Annual) New Delhi: Central Statistical Organisation, Department of statistics, Ministry of Planning, Government of India. Selected Educational Statistics. (Annual) New Delhi: Ministry of Human Resource Development, Department of Education, Planning, Monitoring and Statistics Division, Government of India. Statistical Abstract of India. (Annual) New Delhi: Central Statistical Organisation, Department of Statistics, Ministry of Planning, Government of India.